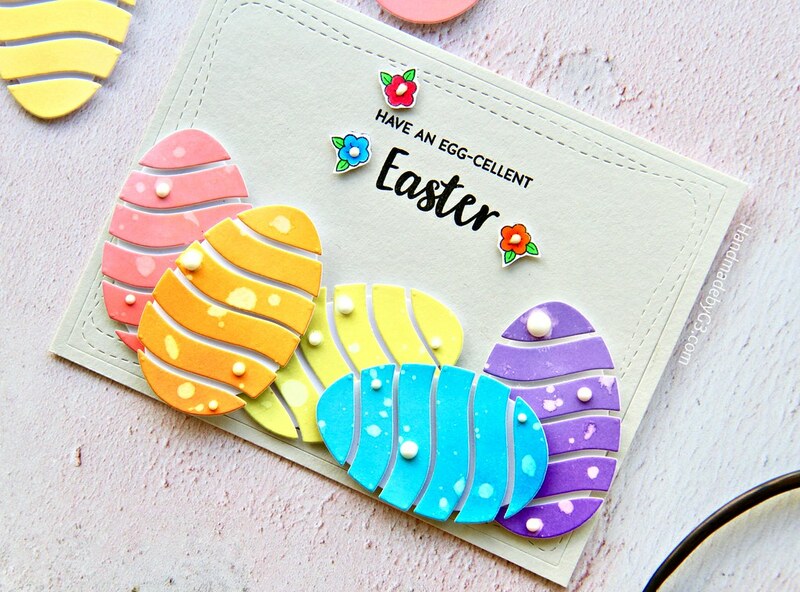 I have been playing with Simon Says Stamp’s Fresh Bloom collection die called Wavy Egg. And I made this Easter card. Hello and welcome back to my blog. Hope you are having a great day. I have been a bit busy with release projects and other projects over past week, I am going away today for a week to India. I am going to attend a wedding of a cousin of my husband. I am excited to attend a wedding after a long time. Looking forward to the celebrations and share some pictures over the weekend. So there will be no post from me till Wednesday following week. I will be back in full force from Thursday 27th March. Here is the Easter card I made today. 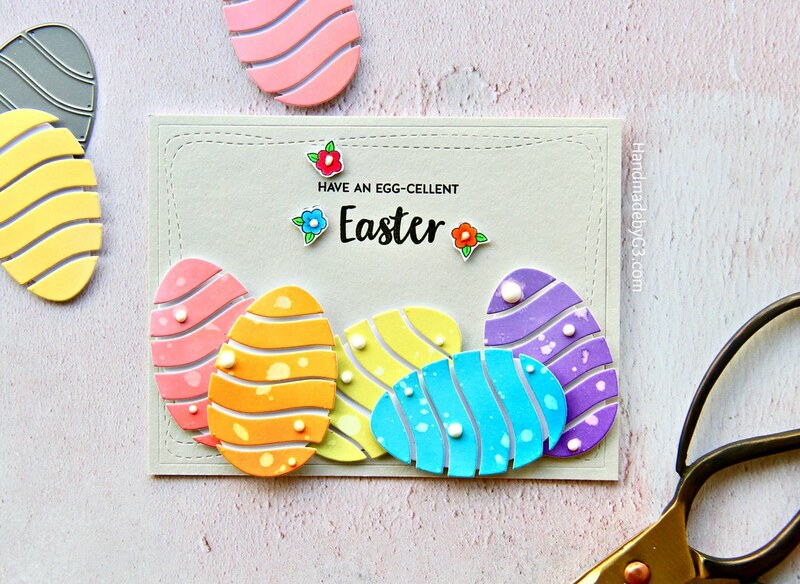 So I sponged a rainbow of Distress Oxide inks on white cardstock, then used the Wavy Egg to die cut them out. I also die cut a small oval die upon which I adhered the wavy pieces to make the full eggs. I spattered clean clear water to get texture on the eggs. For the background I embossed the largest Stitched Wonky Rectangle die on Fog cardstock panel. 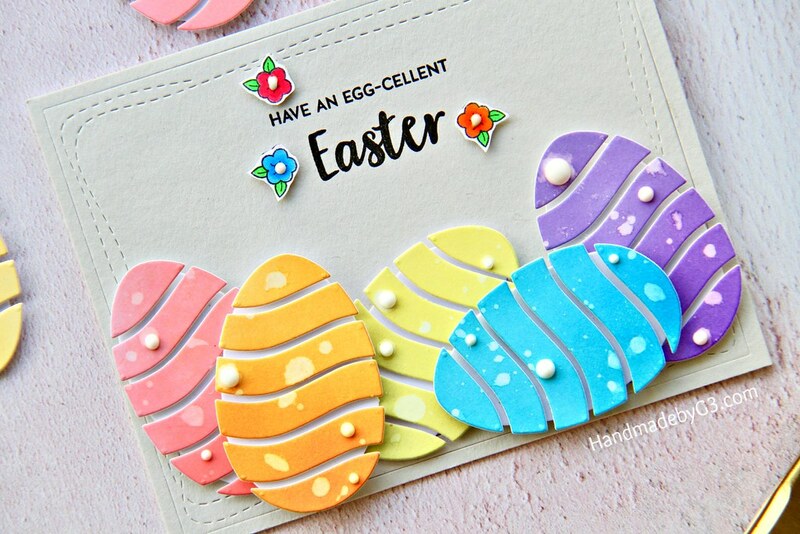 Adhered this on the card front and arranged and glued the eggs on the bottom of the card front. The sentiment is from Bunny Wishes stamp set. I stamped this directly on the fog panel using Versafine Onyx black ink. To frame the sentiment, I used the small flower image from Bunny Wishes stamp set. I stamped, coloured with copics and hand cut them out to adhere using foam adhesives. Finally a few white Nuvo crystal drops to complete the card. Thank you very much for taking the time to visit my blog today. Have a lovely day! WONDERFUL card! Love those eggs!